Josephine Henry was born circa 1850 at Ohio. She was the daughter of Jacob Henry and Jane (?). [S248] U.S. Federal Census 1860 U.S. Federal Census, by Ancestry.com, Page 156. Dwelling 1178. Mary Henry was born circa 1852 at Ohio. Harrison Henry was born circa 1856 at Ohio. He was the son of Jacob Henry and Jane (?). Amos Henry was born circa 1858 at Wisconsin. Name Variation Barnabas Prouty was also known as Barnabus. Barnabas Prouty was born on 16 March 1809 at New York. He was the son of Stephen Prouty and Elizabeth Cooley. Barnabas Prouty married Rebecca Trumbo on 21 February 1833 at Richland, Ohio. Barnabas Prouty died on 2 February 1902 at Sauk, Wisconsin, at age 92. [S248] U.S. Federal Census 1860 U.S. Federal Census, by Ancestry.com, Page 156. Dwelling 1185. [S246] U.S. Federal Census 1880 U.S. Federal Census, by Ancestry.com, ED246. Dwelling 85. [S245] U.S. Federal Census 1900 U.S. Federal Census, by Ancestry.com, Year: 1900; Census Place: Bear Creek, Sauk, Wisconsin; Roll: T623_1816; Page: 4A; Enumeration District: 129. Married Name 21 February 1833 As of 21 February 1833,her married name was Prouty. Rebecca Trumbo was born on 26 February 1812 at Ohio. She married Barnabas Prouty, son of Stephen Prouty and Elizabeth Cooley, on 21 February 1833 at Richland, Ohio. Rebecca Trumbo died on 9 October 1887 at 75y 7m 13d at age 75. Name Variation John T. Prouty was also known as J. T.
John T. Prouty was born on 21 July 1837 at Morrow, Ohio. He was the son of Barnabas Prouty and Rebecca Trumbo. John T. Prouty married Marietta Shultz on 3 March 1867 at Sauk, Wisconsin. 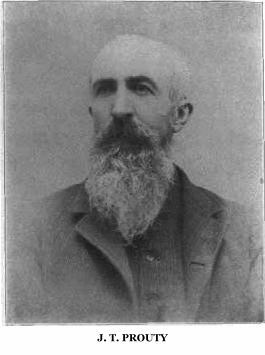 John T. Prouty died after 1900. J.T. Prouty was the first settler of the City of O’Neill, and was, at the time of the filing on his homestead one of the first white settlers in the Upper Elkhorn Valley. He was the first merchant, the first notary public of the county and holds several other premier honors of the early day. His claim, was at the time of his locating on it, five miles west of William H. Inman’s, one of his old school chums, the next nearest neighbor. Mr. Prouty moved on his homestead quarter on July 14, 1873 and with his timber had a fine body of land in a beautiful valley. J.T. Prouty was born in Morrow County Ohio on July 21, 1837, the son of Barnabas and Rebecca (Trumbo) Prouty. In 1854 the father moved with his family to Sauk County, Wisconsin, where J.T. began life for himself in 1859 farming a 90 acres tract of land, continuing to live with his parents until 1867. He learned the trade of cabinetmaker and wood turner, carrying this on in connection with farming. That trade helped him find employment on his trip west. Mr. Prouty first settled in Holt County, then known as Elkhorn County in July 1873 reaching his claim on the 14th day of that month. He traveled from Wisconsin camping by the wayside for 43 ½ days. The first dwelling was partly lumber and partly canvas from the wagon cover. The town of O’Neill, to be, was first known as Rockford and Mr. Prouty was the first Postmaster. When the colony of which General John O’Neill was to head, came to the country, Mr. & Mrs. Prouty fed them at barely the cost of provisions, and helped them to get established in the new country. About four years after the railroad come through in 1881, Mr. Prouty moved to the north border of Holt county and secured a fine tract of land near where the Post Office of Paddack was established, of which he was the postmaster after moving to this point. He lived and prospered at Paddock for 25 years, retired at Atkinson and moved to Spencer 6 years later. One of the most interesting personalities to be found within the borders of the state of Nebraska is the venerable John T. Prouty, a portrait of whom is presented on another page, now living, retired from active life, in the town of Spencer. He is the first settler of the city of O'Neill, and was, at the time of filing on his homestead claim there, one of the first white settlers in the upper Elkhorn valley. He was the first merchant of the place, the first notary public of the county, and holds several other premier honors of the early day. His claim was, at the time of his locating on it, five miles west of that of William H. Inman's, one of his old school chums, the next nearest neighbor to civilization. Mr. Prouty moved on to his homestead quarter July 14, 1873, and with his timber and pre-emption claims had a fine body of land in the beautiful valley. In strange contrast with actual developments, he amusingly relates that he and a neighbor agreed that a man might extract a living from the soil of the immediate valley of the Elkhorn, but that to attempt to do so from the broad tract of prairie to the north would be utter folly, because of the lack of rain and the yearly prairie fires. This entire region is now a thickly settled, highly productive part of at fertile commonwealth. Mr. Prouty was born in Morrow county, Ohio, July 21, 1837, a son of Barnabas and Rebecca (Trumbo) Prouty. In 1854 the father moved with his family to Sauk county, Wisconsin, where the son began life for himself in 1859, farming a ninety acre tract of land, though continuing under the parental roof until 1867. This was heavily wooded land and had to be cleared of the timber before it could be brought under the plow. Thousands of feet of fine timber, that today would be worth a fortune, were felled, rolled into heaps, and burned as a cumbrance to the ground. Log houses with puncheon floors, open fireplaces, and stick chimneys were the rule, and a house with a brick or stone chimney was an unusual sight. Bunches of hickory, splits bound together, were used at night as torches to light the way from one house to another, though travel by night was an unusual occurrence. Mr. Prouty learned the trade of cabinet maker and wood turner, carrying this on in connection with farming, and found employment at this vocation up to the time of his coming west. Craftsmanship is a trait of the family, a brother of Mr. Prouty's in Chicago being an inventor of many useful railroad and other appliances. Mr. Prouty first settled in Holt county, then known as Elkhorn county, in July, 1873, reaching his claim on the fourteenth day of the month. They drove through from Wisconsin, camping by the wayside, and were forty-three and a half days on the road before reaching their journey's end. For a time they lived in the wagon, Mrs. Prouty sleeping in it while Mr. Prouty was under on the ground; and their first shack of a dwelling was covered partly with lumber and partly with the canvas wagon cover. The town of O'Neill, to be, was first known as Rockford, and Mr. Prouty was its first postmaster. He planted the first grove there, and the fine old trees in the end of town, where the round house stands, were planted by his own hands on his pre-emption claim. Norfolk, ninety miles distant, was their trading point, and it often required five or six days to make the round trip with even a light load. The scourge of grasshoppers swept the country in 1874, devouring their only crop - seventeen acres of corn - and the two years following wheat and oats were their principal bill of fare, only a scant supply of the crops being left for the settlers. When the colony of which General John O'Neill was the head, came to the county, Mr. and Mrs. Prouty fed them at barely the cost of provisions, and helped them to get established in the new country. After the railroad came through in 1881, and four years later, Mr. Prouty removed to the north border of Holt county and secured a fine tract of land near where the postoffice of Paddock was established, of which he was postmaster after moving to this point. He lived, and prospered, at Paddock for twenty-five years, retired to Atkinson in 1902, and came to Spencer six years later. Here he keeps a successful apiary, for, being still a man of vigorous vitality, he finds something to keep his hands and mind busy that he may not rust out. Mr. Prouty owns two fine ranches, three miles apart, of three hundred and forty-five acres and one hundred and forty-three acres respectively, in each of which are numerous fine springs of excellent water with an unlimited supply in the Niobrara river near by. When the first wagon train's made their way up the Elkhorn valley to the Black Hills, they made Mr. Prouty's house a stopping place, getting there the last meals at table in a civilized way. The first lyceum was held in this part of the west at the home of Mr. and Mrs. Prouty, December 2, 1873; the first Sunday school on the fourteenth of the same month; and the first prayer meeting one week later. No sermon was preached here until April 20, 1875, when a minister of the Methodist denomination held services at the home of Elijah Thompson. Mr. Prouty was first chairman of the republican county committee, being elected at the convention held in Norfork in May, 1875, and, as stated before, was the first postmaster of Rockford, his commission bearing date of June 18, 1874. His first commission as notary public was dated June 20, 1874, and this was renewed repeatedly until he had filled the office for twenty-four years. In the fall of 1876, during the Hayes and Wheeler campaign, a republican rally was held at Mr. Prouty's place. The ladies of the neighborhood bought the material for a flag, which was made at the Prouty home and raised for the first time on the day of the rally, and for many years after used at any celebration or special occasion in Holt county. On the organization of Holt county, Mr. Prouty served as first county clerk. While living at Paddock, Indians were plentiful on the reservation across the Niobrara, and its many as seven thousand of them were seen in camp there at one time; they were eager traders and would swap even their clothes for a chicken or a piece of pork, of which they were very fond. Mr. Prouty was married in Sauk county, Wisconsin, March 3, 1867, to Miss Marietta Shultz, who was born in Conneaut, Ohio. Her parents were Adam and Lucy (Quatermass) Shultz, the former born in Lancaster, Pennsylvania, and the latter in Essex county, New York. The children born to Mr. and Mrs. Prouty are: Angela, wife of Eugene Sebring, of Quincy, Michigan; and Harry S., who has a ranch of seven hundred and twenty acres near the old home place in Holt county; and leases, in addition, the three hundred and forty acre ranch his father owns. Mr. Prouty is a republican in politics and was for years "wheel horse" in the political team. Mrs. Prouty is a member of the Methodist Episcopal church. Few men can claim to be as temperate as Mr. Prouty, he having been a total abstainer all his life from liquor and tobacco in all forms. He is very careful of his language, never indulging in profanity or vulgarity. [S245] U.S. Federal Census 1900 U.S. Federal Census, by Ancestry.com, Year: 1900; Census Place: Paddock, Holt, Nebraska; Roll: T623_930 Page: 4B; Enumeration District: 120. Name Variation Stephan Prouty was also known as Stephen. Stephan Prouty married Sarah Guin. Stephan Prouty was born in 1838 at Ohio. Stephan Prouty died on 3 May 1899. [S246] U.S. Federal Census 1880 U.S. Federal Census, by Ancestry.com, NA Film Number T9-1446 Page Number 262B. Name Variation Joshua Prouty was also known as Joshway. Joshua Prouty married Elizabeth Freeman. Joshua Prouty was born in 1841 at Ohio. Joshua Prouty died on 10 August 1909. [S247] U.S. Federal Census 1870 U.S. Federal Census, by Ancestry.com, Dwelling 79. [S246] U.S. Federal Census 1880 U.S. Federal Census, by Ancestry.com, ED246. Dwelling 86. Reverand Enoch Dye Prouty was born on 1 May 1844 at Richland, Ohio. Reverand Enoch Dye Prouty married Charlotte W. Weller on 17 March 1865. Reverand Enoch Dye Prouty and Charlotte W. Weller were divorced before December 1886. Reverand Enoch Dye Prouty married Olive Serene Tiffany on 25 December 1886 at Chicago, Cook, Illinois. Reverand Enoch Dye Prouty died on 1 September 1935 at Oakland, Michigan, at age 91. Formerly a Baptist minister, and the inventor of the famous PROUTY power printing press, and other valuable inventions, now in business in Chicago [Cook County, IL]. REV. E. PROUTY, Pastor of Baptist Church, Mazomanie; Mr. Prouty was born in Ohio in 1844; his parents, Barnabas and Rebecca Prouty, with their family of eight children, came to Wisconsin, and settled in what is now the town of Bear Lake, Sauk Co., in 1854; the parents still reside where they first settled, and six of their children live in the immediate vicinity of their parents; another is a resident of Nebraska. Mr. Prouty was ordained February 14, 1870; previous to his coming to Mazomanie, he was Pastor of the Baptist Church at Spring Green and at Boscobel; Mr. Prouty has a great fondness for mechanical pursuits, and before what he believed to have been his duty prompted him to enter the ministry, was engaged in his favorite work; he became an excellent machinist without serving an apprenticeship to the business; while Pastor of the church at Boscobel, he invented what is known as the "Prouty Power Printing Press," which has become celebrated as the cheapest and one of the best printing presses now manufactured. During two years of his residence at Boscobel, he published a paper called the Temperance Watchman, using one of his own presses. Mr. Prouty is a member of the State Board of Missionaries. He was married to Charlotte W. Weller, daughter of William Weller, an early settler of Richland Co., Wis; they have three children--Lodemie E., Minerva E. and Winnie P. Reverand Enoch Dye Prouty was a manufacturer of gas engines in 1900. He was a employer of inventions in 1910. He was a farmer of general farm in 1920. He was a salesman of supplies in 1930. [S247] U.S. Federal Census 1870 U.S. Federal Census, by Ancestry.com, Year: 1870; Census Place: Spring Green, Sauk, Wisconsin; Roll: M593_1739; Page: 243; Image: 490. [S246] U.S. Federal Census 1880 U.S. Federal Census, by Ancestry.com, NA Film Number T9-1422 Page Number 200D. [S245] U.S. Federal Census 1900 U.S. Federal Census, by Ancestry.com, Year: 1900; Census Place: Chicago Ward 34, Cook, Illinois; Roll: T623_289 Page: 4B; Enumeration District: 1081. [S244] U.S. Federal Census 1910 U.S. Federal Census, by Ancestry.com, ED433. Dwelling 94. [S243] U.S. Federal Census 1920 U.S. Federal Census, by Ancestry.com, Year: 1920;Census Place: Arcadia, De Soto, Florida; Roll: T625_217; Page: 10A; Enumeration District: 15; Image: 244. [S250] U.S. Federal Census 1930 U.S. Federal Census, by Ancestry.com, ED989. Dwelling 8. Jeremiah R. Prouty married Thirza A. Youngs. Jeremiah R. Prouty was born on 17 December 1849 at Morrow, Ohio. Jeremiah R. Prouty died on 26 February 1927 at Vernon, Wisconsin, at age 77. Hiram Prouty was born in April 1854 at Ohio. Hiram Prouty married Martha Jane Emery circa 1883. Hiram Prouty died on 9 November 1941 at age 87. Stephen Prouty was born circa 1767 at Connecticut. He married Elizabeth Cooley in 1791. Stephen Prouty died circa 1861. [S249] U.S. Federal Census 1850 U.S. Federal Census, by Ancestry.com, Dwelling 880. [S248] U.S. Federal Census 1860 U.S. Federal Census, by Ancestry.com, Dwelling 656. Married Name 1791 As of 1791,her married name was Prouty. Elizabeth Cooley was born circa 1772 at New York. She married Stephen Prouty in 1791. Elizabeth Cooley died circa 1865. Reverand Andrew Leal Prouty was born on 9 February 1834 at Morrow, Ohio. Reverand Andrew Leal Prouty married Delilah Truax on 13 May 1854 at Morrow, Ohio. Reverand Andrew Leal Prouty died on 16 February 1910 at Sauk, Wisconsin, at age 76. [S248] U.S. Federal Census 1860 U.S. Federal Census, by Ancestry.com, Dwelling 1271. [S247] U.S. Federal Census 1870 U.S. Federal Census, by Ancestry.com, Dwelling 78. Married Name 13 May 1854 As of 13 May 1854,her married name was Prouty. Delilah Truax was born on 28 October 1828 at Ohio. She married Reverand Andrew Leal Prouty, son of Barnabas Prouty and Rebecca Trumbo, on 13 May 1854 at Morrow, Ohio. Delilah Truax died on 20 January 1900 at age 71. Married Name Her married name was Prouty. Elizabeth Freeman married Joshua Prouty, son of Barnabas Prouty and Rebecca Trumbo. Elizabeth Freeman was born on 17 April 1846 at England. She died on 27 February 1903 at age 56. Name Variation William Oscar Prouty was also known as Oscar William. William Oscar Prouty was born in July 1868 at Wisconsin. He was the son of Joshua Prouty and Elizabeth Freeman. William Oscar Prouty married Christina Weitzel, daughter of Peter Weitzel and Mary Zeckman, on 18 January 1897 at Sauk, Wisconsin. William Oscar Prouty died on 15 November 1942 at age 74. [S245] U.S. Federal Census 1900 U.S. Federal Census, by Ancestry.com, Year: 1900; Census Place: Bear Creek, Sauk, Wisconsin; Roll: T623_1816; Page: 6A; Enumeration District: 129. Elmer E. Prouty was born in 1873 at Wisconsin. Elmer E. Prouty died in 1941. Elsie L. Prouty was born in June 1879 at Wisconsin. She was the daughter of Joshua Prouty and Elizabeth Freeman. Name Variation Sarah Guin was also known as Gwin. Sarah Guin married Stephan Prouty, son of Barnabas Prouty and Rebecca Trumbo. Sarah Guin was born in 1845 at Ohio. She died on 3 September 1898 also reported as 1893. John Byron Prouty was born on 9 February 1856 at Washington, Sauk, Wisconsin. He was the son of Reverand Andrew Leal Prouty and Delilah Truax. John Byron Prouty married Sarah Ann Lunn, daughter of Joseph Lunn and Ann Taylor, in 1886. John Byron PROUTY, a representative of one of the pioneer families of Sauk County, WI, is an influential citizen and successful farmer of Washington Township, where he makes his home on section 29. He was born in Washington Township, Sauk County, WI, 09 Feb 1856, and was a son of Rev. Andrew and Delilah (TRUAX) PROUTY. The grandparents of our subject bore the name of Barnabas and Rebecca (TRUMBO) PROUTY. The grandfather was a native of OH and was of New England ancestry, while the grandmother was of German descent. Barbabas PROUTY came to Sauk County in 1853, where he still lives at the age of 90. He enjoys good health and mental activity. Eight sons were born to that worthy couple: (1) Andrew, (2) John, a prominent citizen of O'Neill [Holt County], NE; (3) Barnabas. of Sauk County [WI]; (4) Joshua, of Sauk County; (5) Stephen, deceased; (6) Enoch, formerly a Baptist minister, and the inventor of the famous PROUTY power printing press, and other valuable inventions, now in business in Chicago [Cook County, IL]; (7) Jeremiah, of Sauk County; and (8) Hiram, also residing in Sauk County [WI]. The oldest son, Andrew PROUTY, was born in Morrill County, OH, and came to WI with his father, and has since resided in Washington Township [Sauk County]. He received a liberal education in OH, and taught school several years after locating in WI, and a few years afterward was ordained a minister of the Baptist church. For some years he filled regular pastorates, and spent about ten years in the active ministry, and still holds occasional services. He has been a member of the board of supervisors, and works for the interests of his community. The mother of our subject was born in OH. John Byron PROUTY attended the public schools of Sauk County, and at the age of 21 began earning his livelihood as a farm laborer. His present fine farm comprises 180 acres and is near the village of Sandusky, Washington Township, Sauk County [WI], and he has made his home on that place since 1886. He devotes his attention to livestock raising and dairying. The farm is the old LUNN homestead. Mr. PROUTY was married in 1886 to Sarah Ann LUNN, daughter of Joseph and Ann (TAYLOR) LUNN, prominent pioneers of Washington Township [Sauk County, WI]. They went there from Milwaukee in 1857, settling near the village of Sandusky. Mrs. PROUTY's father was one of the most successful farmers of Sauk County. He was born in Yorkshire, England, and died in 1882, aged 66 years. Mrs. PROUTY's mother was born near Manchester, England, and came to the [p 373] U. S. in 1839. She died in 1882, aged nearly 62 years. Mrs. PROUTY was one of a family of then children, among whom was James T. LUNN, who was county superintendent of schools in Sauk County for 11 years, and is now a prominent business man of Sioux Falls [Minnehaha County], SD. Mrs. PROUTY is a lady of culture and good education, and was engaged in teaching for several years. Three children have been born to Mr. and Mrs. PROUTY: (1) Florence Edna, (2) Ernest Andrew and (3) Everett Samuel. The sons are twins. Mr. PROUTY is active in all public movements, and is a Republican in political sentiment. He attends most of the county conventions, and in 1898 was a delegate to the state convention in the interest of LaFollette for governor. He is at present chairman of the township committee, and a member of the county committee. He has filled the office of township treasurer, and has gained the confidence of the people of his township and county, and is well known as a man of broad mind and energetic character. Married Name 1886 As of 1886,her married name was Prouty. Sarah Ann Lunn was the daughter of Joseph Lunn and Ann Taylor. Sarah Ann Lunn married John Byron Prouty, son of Reverand Andrew Leal Prouty and Delilah Truax, in 1886. Joseph Lunn married Ann Taylor. Joseph Lunn was born circa 1816 at Yorkshire, England. Married Name Her married name was Lunn. Ann Taylor married Joseph Lunn. Ann Taylor was born circa 1820 at near Manchester, England. 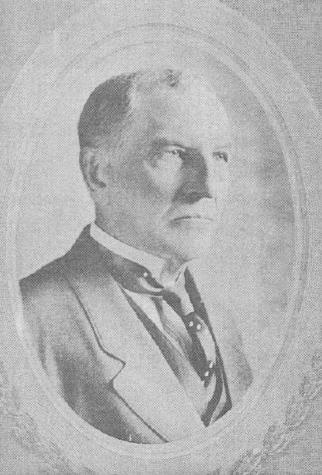 James T. Lunn was the son of Joseph Lunn and Ann Taylor. Florence Edna Prouty was the daughter of John Byron Prouty and Sarah Ann Lunn. Ernest Andrew Prouty married Frances W. Dickson. Ernest Andrew Prouty was born in 1893 twin with Everett Samuel. He was the son of John Byron Prouty and Sarah Ann Lunn. Ernest Andrew Prouty died on 25 September 1964. Everett Samuel Prouty was born in 1893 twin with Ernest Andrew. Frances W. Dickson married Ernest Andrew Prouty, son of John Byron Prouty and Sarah Ann Lunn. Frances W. Dickson was born in 1890. She died on 3 January 1980.